DearMYRTLE's Genealogy Blog: MGP Study Group: Chapter 8, 9 and GRADUATION!! 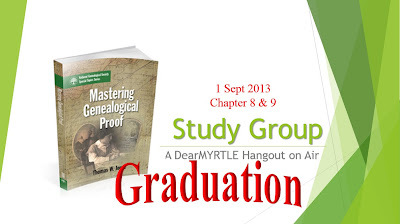 After teaching us about the quality of records, analysis and correlation of information from a variety of sources, Dr. Jones, author of Mastering Genealogical Proof (1) now moves us in these closing chapters 8 and 9 to look with a well-informed, critical eye at books, journals, websites and our own compiled genealogy. Join the MGP Study Group tonight for a look at what our panelists discovered in our search. We'll also discuss how this awesome study group worked -- it's strength and weaknesses. All with an eye to beginning a second study group sometime this winter, or summer, depending on your hemisphere. We begin tonight at 8pm Eastern US (New York) in our Google+ Hangout on Air (HOA) format. Participants will wait to VIEW on the YouTube side, and will post questions in the DearMYRTLE Genealogy Community on Google+. Cousin +Russ Worthington will do his best to weave those questions and comments into our panel discussion. Unlike a webinar, the link for a G+ Hangout on Air isn't created until just before the event is to go live. NOTE: The "filmstrip" of panelists receive their own invitations to JOIN the HOA. Panelists merely log in to our private G+ MGP Study Group Panelists community where I'll post the link. (1) Thomas W. Jones, Mastering Genealogical Proof (Arlington, Virginia: National Genealogical Society, 2013) 83.